OS X Mavericks 10.9.3 Beta 3 Build: 13D21 has officially released by Apple for developers and Mac users. Just like recently update OS X Mavericks 10.9.3 Beta 1 Build: 13D12. Apple also updated the iTunes 11.1.6 Beta 6 and Safari 7.0.3 Seed 1 Mavericks. Here I want to share you Safari 7.0.3 Seed 1, iTunes 11.1.6 Beta 6 and OS X Mavericks 10.9.3 Beta 3 Build: 13D21 official direct download URL’s/Link and .DMG update files are also available below. Just download/install on your iPhone, iPod Touch and iPad devices. There are several new beta updates for OS X Mavericks 10.9.3 firstly iTunes 11.1.6 & secondly 7.0.3 with the enhancements of new features. 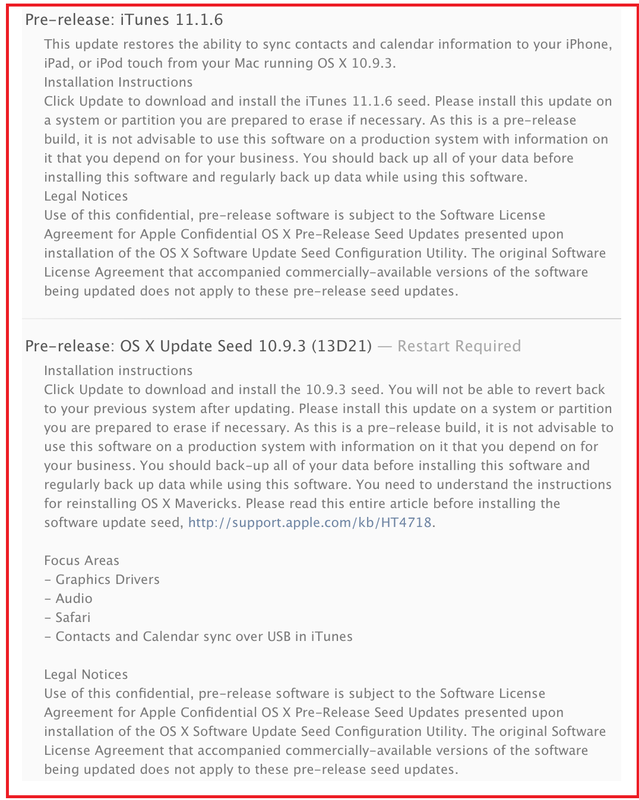 Why developers and users download OS X Mavericks 10.9.3 Beta 3 Build: 13D21. Because in this updates developers and users can get new Graphic Drivers with improve audio quality, Apple safari, calendar & contacts Sync over USB in iTunes, 4K displays support, better Retina resolutions for readability and latest MacBook Pro models with the support for 60Hz output various fixes bug, improve performance, better and stability fixes. How to Install OS X Mavericks 10.9.3 Beta 3 Build: 13D21, iTunes 11.1.6 Beta 6 & Safari 7.0.3? Now everybody want to switch new software so if you want to update or upgrade your present software then just visit your Mac app store then enter into software update tab. IF you are OS X developers then you download/install through OS X developer site and for general users can able to install/download Safari 7.0.3 Seed 1, iTunes 11.1.6 Beta 6 and OS X Build: 13D21 Mavericks 10.9.3 Beta 3 .DMG Update Files through Direct URL’s. This update is initial release to OS X Mavericks 10.9 so perhaps Apple release new update OS X 10.9.3 Beta 4 or OS X 10.9.3 Beta 5 in future.